Your money’s gone to Iceland. There’s nothing in your purse. Ten times your earning power. Too late to curse and glower. You were heading for a fall. When the bailiff comes to call. And your life goes down the spout. Who pays for his life of luxury? You guessed it. You’re the one. Whilst the scum at the top escape with their gains. By popular request and especially after I read about Sir Fred Goodwin, now ex Chief Executive of the Royal Bank of Scotland, who earned only £4.1 million last year, including a £2.86 million 'bonus'. He generously waived his 'right' to a £1.2 million severance payment, but for some reason he keeps his annual pension of £579,000. I can't detail all the others in the same position, because it just makes me sick! 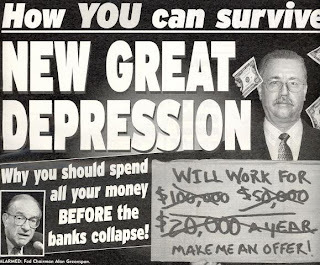 I expect in the next few months, we'll be reading depressed economy poetry.